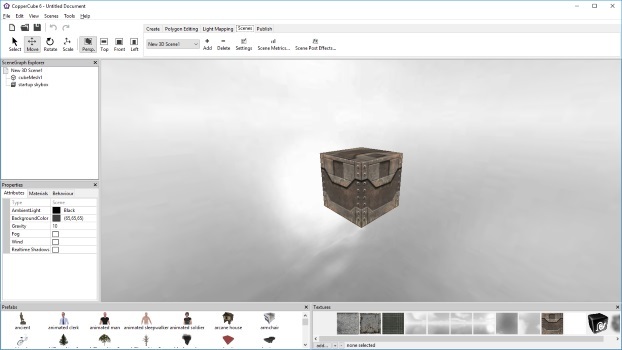 Edit your 3D scene in the Coppercube editor. 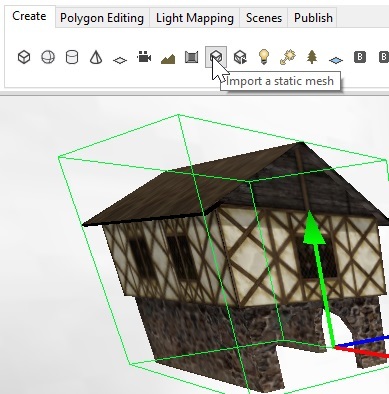 Create 3D geometry in the editor and/or import it from other 3D modelling tools. Apply collision settings, textures, materials and other to the items in your scene. Select a target (like Windows or WebGL) and click 'publish' to test your 3d scene. The CopperCube Editor after starting up. If you haven't yet, you can download Coppercube from the www.ambiera.com website. The editor is quite simple to use: When starting the editor, there is a main view and a toolbar. With the 4 view port buttons, it is possible to change the currently active view into other modes: Viewing the scene from the perspective, from the top, left or right. The buttons for the 4 main tools. The 4 buttons to the left (Move camera, move object, rotate object and scale object) are the main tools you will need to use. Select one of these and you can modify most objects in the 3d scene easily when selecting it and dragging one of the arrows displayed on the object then. You can also use the shortcuts Q, W, E and R for this. The most important thing to do is to create objects in your 3D scene. You can do this by clicking a button in the tool bar in the tab 'scene editing'. The buttons for adding new items to the scene. With the cube button, you can create a cube, for example. Double clicking on one of the textures in the texture window below will assign a new texture for it. There are other buttons for creating spheres, cones and cylinders as well. But for more sophisticated objects, you may want to import an existing 3D mesh or one which you created in an external 3D modelling package such as Maya, 3D Studio, Softimage, Blender or Anim8or. Coppercube is able to import a huge amount of file formats (e.g. : .fbx, .3ds, .obj, .b3d, .csm, .dae, .dmf, .oct, .irrmesh, .lwo, .x, .ms3d, .my3D, .mesh, .lmts, .bsp, .md2, .stl), so you only need to save your mesh in one of these supported file formats or use an exporter for one of these formats in your 3D package. To import an external 3D file, use the command File -> Import -> Static Mesh or click the toolbar button to import the file. Voila, it's now in Coppercube and you can place it, scale it, edit its materials, and use it in your 3D scene.